We specialize in meeting the needs of the waste hauling and recycling industry. 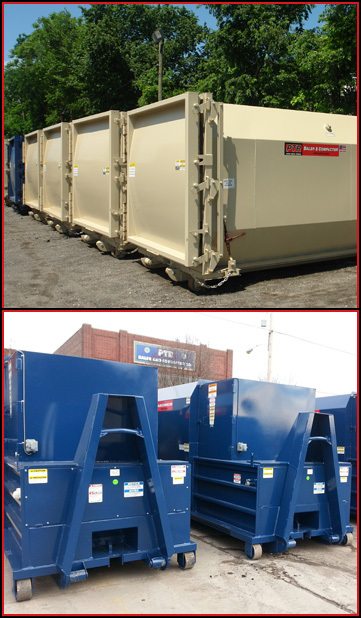 We carry a large stock of waste compactors and recycling balers for quick delivery. Our turn-key solution allows you to focus on what you do best, managing your customer’s waste and recycling streams. PTR has dedicated sales personnel specifically trained in meeting your unique business needs. Our account representatives will make sure that your equipment and service requirements are met to your satisfaction. PTR’s large U.S manufacturing facility and stocking programs assure quick delivery to your customer locations. We can help you provide your customers with a complete waste stream solution. We back our commitment to quality with a full best in industry warranty and complete nationwide service network. PTR Baler and Compactor Company is your premier source of quality equipment delivered fast, installed right and providing many years of low maintenance operation. PTR Baler and Compactor Company can provide recycling equipment to your customer locations that will allow them to process a wide variety of waste in the most economical and environmentally friendly method. The waste hauler can then schedule a pick-up for these recycled commodities and enjoy the benefits of offering a one-stop complete waste solution to their customer base. Wet Waste: Wet waste streams typically include organic materials such as food and liquid waste. Our self-contained compactors are designed to prevent the leakage of fluids, reducing the exposure to pests and unpleasant odors. Dry Waste: The stationary compactor is the solution for facilities that generate dry waste such as home supply chains, clothing chains, department store chains and distribution centers. After the waste is compacted into the container the container is removed from the stationary compactor, emptied and delivered back to the location by the waste hauler. Recyclable Waste: Sustainability programs, good corporate citizenship and new recycling regulations are leading to increased waste diversion goals for many companies. What was once considered waste is now considered a valuable commodity that can be diverted from the landfill to a recycling facility. Cardboard, plastic bags, shrink wrap, plastic bottles, aluminum cans and co-mingled recyclables (sandwich bales) are all opportunities for waste diversion. We offer a full line of balers that will meet your customers waste stream requirements while also providing you with a cost effective method to commoditize these waste streams while also benefiting the environment. PTR is the pinnacle of quality in the baler and compactor industry with the installed base to prove it. Our products are built to last and backed with a comprehensive warranty. Each PTR unit is meticulously engineered and inspected to provide superior performance for the life of the product. All of our products are built with safety in mind and meet OSHA and NOISH recommendations. Our UL approved products are thoroughly tested to insure safe reliable operation for many years to come. PTR Baler and Compactor Service also offers a nationwide repair service and preventative maintenance contracts. Our waste equipment management programs insure your equipment can continue to meet your needs without the need for internal maintenance workers and logistics personnel.